A muscle contusion (corky) is usually the result of a direct impact to the muscle from an object, or by contact with a person. The most common site for a contusion is in the thigh region and is quite common in contact or collision sports such as football and basketball. 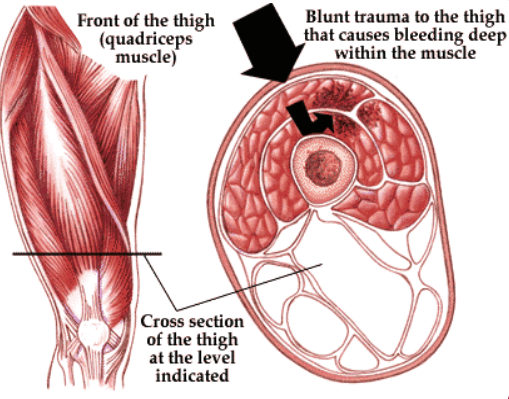 The blow to the muscle causes local muscle damage with associated bleeding. Contusions can range from minor blows, resulting in minimal pain and loss of activity, to severe contusions resulting in significant pain and loss of function. How the injury occurred along with other signs such as local tenderness, swelling and increased pain on movement and stretch indicate a muscle contusion. Severe pain at the time of the injury may limit the ability to walk and continue to participate in activities. The blow causes damage to local blood vessels and muscle tissue. Bruising may or may not be present depending on the depth of the contusion. A contusion without bruising can often be more painful and restrictive as the blood can get trapped within the tissue layers. Sometimes with severe contusions, the swelling may track down to the knee joint or lower leg or even press on nerves in the area causing pins and needles, numbness or even pain. Initial management of muscle contusions involves the RICE method which helps to minimize further bleeding and swelling within the contusion. Elevation: elevate the affected area to a position that is above the heart. Most muscle contusions are relatively minor and do not limit participation in sport however, when there is a large amount of bleeding the injury severity will be worse. Heat, alcohol, vigorous massage and playing on following injury must be avoided as they all increase the amount of bleeding and worsen the degree of injury. This may increase the recovery time and delay return to sport. Physiotherapy treatment involves soft tissue therapy, massage, dry needling (acupuncture), stretching and strengthening. This will allow the fastest and safest return to sport. Download our fact sheet about muscle contusion including self management strategies (PDF).